Four transient GCM greenhouse gas emission scenarios form the latest IPCC runs (1960-2100) have been selected to be used in the project: ECHAM5-A2, ECHAM5-3-A1B, ECHAM5-1-A1B and HadCM3 A1B. The runs are downscaled to increase the regional resolution. 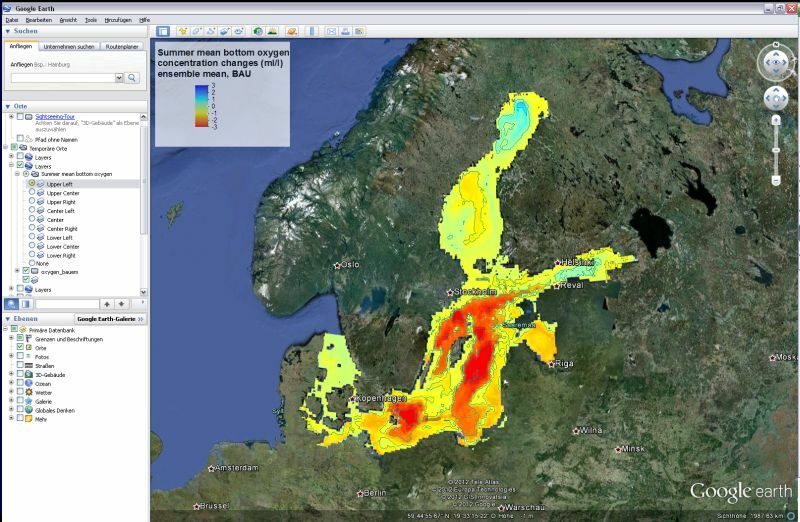 Nutrient scenarios have been conducted using contemporary loads which assumes that no further action will be taken to reduce nutrient input to the Baltic Sea. This scenario can be compared to a scenario simulating the future state of the Baltic Sea when measures of nutrient reductions are undertaken as suggested in the HELCOM Baltic Sea Action Plan. Click here for more background information on climate and nutrient load scenarios. 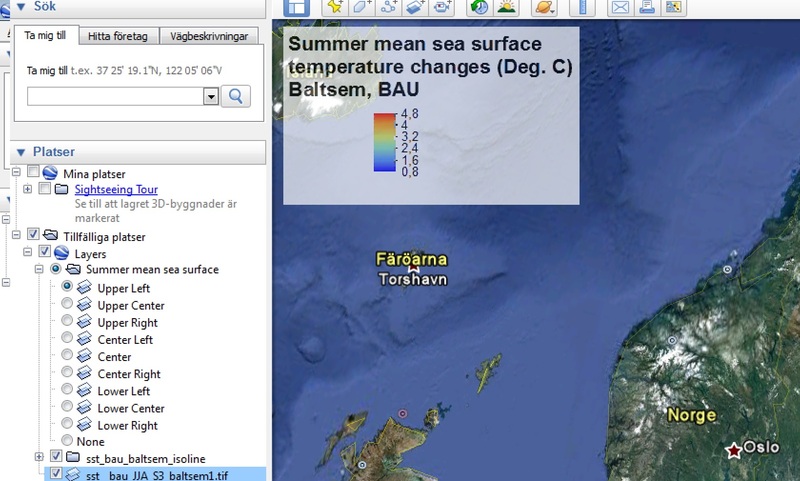 Google Earth can be used to visualize possible developments of different physical and biogeochemical variables, shown as changes between the recent state and the state at the end of the century. 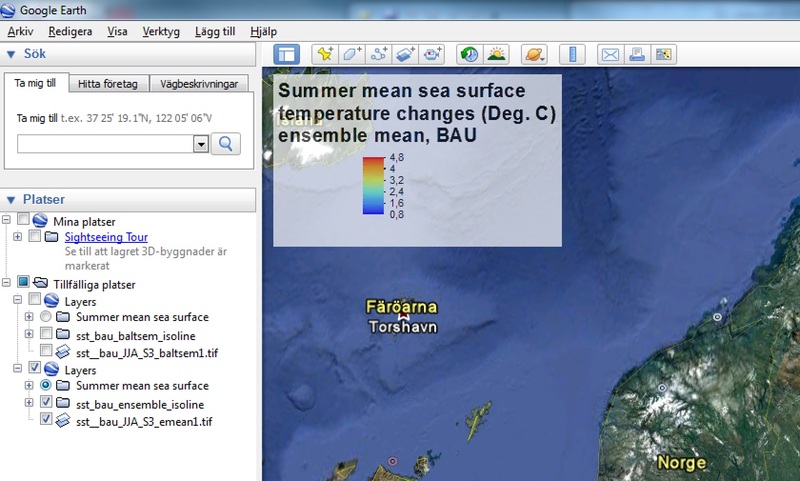 For each variable, four different nutrient load scenarios (BAU, BSAP, CLEG, REF) are calculated using three different coupled physical-biogeochemical models (ERGOM, RCO-SCOBI, BALTSEM) plus the three models combined (ENSEMBLE). If you click on the variable description below, you will open a folder with files. If you have Google Earth installed, a click on these files will open the respective scenario as an overlay in Google Earth. You can navigate through the layers in Google Earth and display a map legend (radio buttons) and isolines (see "Folders" on the left navigation bar). To display the legend associated with a dataset, you need to click in where you want it to be displayed (default is “none”), see example here. If you have downloaded more than one layer, make sure that you have clicked the three options associated with the layer (layer-legend radio button, isoline box and .tif box) and unclick the options associated with the previous layer (see example here). For more information about KMZ files click here. If you have problems opening the files directly in your browser, either try another browser (works with Google Chrome and Mozilla Firefox), or save the files onto your computer to open them directly in Google Earth.